The private spaceflight company Virgin Galactic scored another successful drop test of its SpaceShipTwo suborbital spacecraft today, the latest in a series of smooth solo glides over the California desert for the commercial spaceship. SpaceShipTwo, designed and built by the Mojave-based company Scaled Composites, was released from its huge mothership a little after 8 a.m. local time today (Jan. 13) and soared in glide mode back to Earth to a runway at the Mojave Air and Space Port. The high-altitude flight did not reach space, but was the fourth in a series of demonstration flights ahead of an actual suborbital spaceflight test. 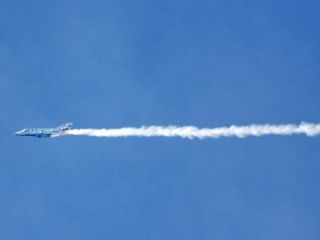 Whitesides told SPACE.com that as part of the test objectives, the pilots vented some water just before coming in to land, which produced a visible contrail. The first SpaceShipTwo vehicle – dubbed the VSS Enterprise – was carried high above the spaceport and then released by its mothership, the WhiteKnightTwo. "Went great," said Burt Rutan, the founder of Scaled Composites in a short but sweet e-mail to SPACE.com. The suborbital spaceliner is designed to carry six passengers and two pilots, flying to the edge of space for a spectacular view of the Earth and several minutes of weightlessness. Virgin Galactic was founded by British entrepreneur and adventurer Sir Richard Branson, famous for creating Virgin Records and Virgin airlines. The SpaceShipTwo has fulfilled an ever-expanding set of flight objectives, starting with its maiden free-flight Oct. 10. It underwent a glide test Oct. 28 and a drop test Nov. 17. According to a Scaled Composites flight log, the SpaceShipTwo has flown exceptionally well, with tests showcasing its stability and control during a glide that typically has lasted 11 to 13 minutes. More tests of the SpaceShipTwo are on the books, part of a campaign to ready the craft for commercial operations. Still to come are flights that will feature short, medium and long blasts from the craft’s hybrid rocket motor. SpaceShipTwo is towed back to the hangar Jan. 13, 2011 under the watchful eye of East Kern Airport District Security Chief Mike Sterbens after a successful drop test and landing at the Mojave Air and Space Port in California. In related news, the nearly completed Spaceport America in New Mexico – to be the hub of Virgin Galactic's space traveloperations – is under evaluation by a six-person team assigned to the task by newly appointed Gov. Susana Martinez. That appraisal follows the Jan. 7 resignation of spaceport chief Rick Homans, executive director of the New Mexico Spaceport Authority, at Martinez’s request. "While I have embraced this project, it is clear that Governor Martinez is not embracing me. I understand politics, and I also understand how critical it is for her to have absolute trust and confidence in the executive leadership of the NMSA. That is a governor’s prerogative and it is necessary for Spaceport America to succeed," Homans, who had been an appointee of Martinez’s predecessor, Gov. Bill Richardson, said in his resignation letter. Homans also stated: "My hope is that Governor Martinez can quickly move beyond viewing Spaceport America as the legacy project of Bill Richardson – the very best thing that can happen is for Governor Martinez to embrace this project as her own legacy. She will be the governor who opens the first, purpose-built commercial spaceport in the world – and the world will be watching." "My association with New Mexico’s Spaceport America has been positive. Mr. Homans has been a delight. His professionalism and friendship within the emerging industry has been exceptional," Witt said. "I have no clue regarding internal New Mexico organization, operation or politics. While the National Space Agency and private space industry as a whole seek direction and speed, it remains difficult to understand New Mexico’s executive leadership stability in the past three years. Personally, I will deeply miss Mr. Homans. My time with him has left me the benefactor." Spaceport America is being built as a state-of-the-art launch facility near the town of Truth or Consequences. It is expected to become fully operational this year. Officials at Spaceport America have been working closely with a number of aerospace firms, such as Armadillo Aerospace, Virgin Galactic, Lockheed Martin, Moog-FTS and UP Aerospace, to develop commercial spaceflight at the new facility.